Create a new plantation or extend an existing one? Collect landscape tiles or rather build onto a Finca in order to cultivate the most points during the next evaluation? Citrus provides players with new challenges, and little is left to chance. The moves are simple, but the decisions are tricky.In order to build, it is essential to harvest your plantations from time to time, as this is the only way to bring new income into your account. But when is the timing right? And, most importantly, which plantation should I harvest, and thus take out of the race for the important points during the Finca scoring? 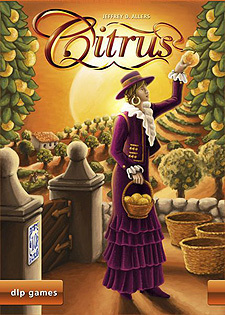 Citrus contains a simplified family variant, as well as a short version of the game. Citrus is particularly suitable for 2 players. Simple moves - tricky decisions! 1. Build: Select a row from the market (marked with arrows) and buy all the plantations from that row. Then pay 1 coin for each plantation and build them immediately. 2. Harvest: Instead of building, you may harvest one or more of your plantation regions. After scoring a region of plantations (some count double), take the worker from that region and place it back on your own board. Then you receive your income.